Tickets available at the Third Man Museum during opening times. Or make reservation via email: contact@3mpc.net Or book and pay online: Click on the TicketJet symbol, change language to English (on top right) and chose date and number of persons. Pay Euro 15.- per ticket, if you wish to attend the concert only. 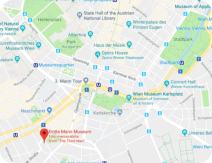 If you plan to visit the Third Man Museum before the concert, please chose the reduced price of Euro 10.- per ticket / Admission to the museum to be paid seperately at the museum.